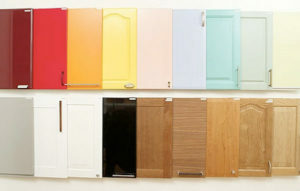 There are a number of material offerings for your cabinets that can make your new kitchen or bath. When you are informed of the differences in these materials you can ensure that your budget is aligned with you design choices. Selecting the right materials can take your dream room from aspiration to an actuality. There are so many different types of materials from wood to metal to laminates. We’ll make sure you know which options work best within the design concept you’ve selected, AND choose materials that are going to work best from a functional and watch-out standpoint. Cherry is a long beloved furniture choice, praised for its natural, reddish-brown color and smooth grain. While it falls on the more expensive side of options, it is deservingly so. Cherry meshes well with almost any design style, from traditional to modern. It’s not only pretty but also extremely durable, great for the rigor of busy kitchens and bathrooms. Distinctive, dramatic and durable, hickory is not a wallflower wood choice in terms of décor. It can also be a bit more on the costlier end of the spectrum, but not in the absolutely higher echelon. Hickory gives great natural patterning and colors that range from pale off-white to reddish-brown. It’s well suited for those desiring a more rustic or even country look for their kitchen or bathroom, but staining/bleaching can help it provide a more modern appeal. Mahogany is thought of as THE deluxe wood for premier cabinetry, and though also on the pricier side, many homeowners consider it worth the extra cost after seeing the end results. The high luster polish that can be achieved is next to none while the durability guards against wear and damage; contrarily, grain abnormalities are often praised for the resulting design. Not just for breakfast (syrup) anymore, maple stands strongly next to oak as the most popular wood for kitchen cabinets in the U.S.—it’s plain to see why this is so, but primarily not just by looking at it. Maple is dense, one of the hardest and heaviest of wood options, chosen for its durability and versatility. Its fine, even grain works well with almost any finish and design style, especially Scandinavian, Early American and French Country. One of the more cost effective cabinetry options, oak is great for traditional, rustic or country designs. It can be easily painted or stained (being a very porous wood) and has terrific lasting power. The color palette includes white, yellow, red or even streaks of green or black. This dark-colored, heartwood beauty will enrich and bolster your cabinets to dramatic effect. Stains and finishes go on easily to produce wondrous effects, making this heavy, strong wood great for a high-end elegance in a wide range of design styles. Metal is making a comeback. Once prevalent in the early to mid-portion of the last century, it has become one of the most popular emerging trends. Preferred for the professional gourmet kitchen, the retro bathroom or for industrial and loft spaces, this sleek and pristine material choice is coming back to the future. And though considered more modern in aesthetics, traditional styles are also available. You can’t beat the sturdiness and ease in painting, though bare metal can be one of the most striking looks to affect in your space. This is the king (or queen) material of choice for the retro cabinet you’ve always longed for. Born of the mid-century era of engineered woods and synthetic veneers, it is renowned for its resistance to scratches, moisture, chemicals, etc. It consists of a resin material adhered to particleboard, medium density fiberboard, or other pressed wood product. Created by heat-fusing a thin layer of vinyl onto a substrate material, thermofoil is well suited for makeover and refacing situations. Thermofoil affects the look of painted surfaces but in an even consistency that paint can’t always provide. Extremely affordable and easy to clean, this is the way to go for bright, clean, well-maintained uniformity.